The Gunfighters is a very difficult story to judge. The series regulars all put in smashing performances - Hartnell in particular having some great moments and lines; his constant renaming of Wyatt Earp to "Mr Werp" is guaranteed to raise a smile, and his reaction to his introduction to the Clanton brothers is simply priceless. The rest of the story is actually fairly enjoyable if a little pedestrian; and boasts some nifty camerawork and ideas, and, for a 1960s television serial, a great set with a great cast inhabiting it. Marred only by the incessant caterwauling of "The Ballad of the Last Chance Saloo n" at every given opportunity. It's a very different view of how historical events played out, with large portions of the show seemingly lifted from a number of Western films, but it's no less enjoyable for that. As usual, the DVD version has been cleaned up considerably, and the qual ity of the presented material is top rate. The DVD also has some great extras, although it is sadly lacking a mute function to save you from the constant high pitched wailing of Lynda Baron singing that wretched ballad. The End of the Line - An honest, truthful and sometimes uncomfortable documentary about the end of William Hartnell's time as the First Doctor. Fascinating to watch, it's a tale of constantly changing writers and editors, forced cast changes and Bill Hartnell's deteriorating health as ateriosclerosis took a toll. With contributions from Donald Tosh, Maureen O'Brien, Peter Purves and Anneke Wills, "End of the Line" shows just how much of a complete slog it was getting Doctor Who out every week on an almost impossibly long production run. If you're a strong fan of William Hartnell it can be a tad unsettling to listen to the less than glowing remarks made of his irascibilty due to illness, but happily Maureen O'Brien and Peter Purves share the other side of the original Time Lord, a deeply passionate and caring man who was very protective of the show itself. It also sheds a somewhat harsh, if truthful, light on Vicki and Dodo's departures from Doctor Who and just how much of an impact The Daleks had on the production of the show. Tomorrow's Times - Mary Tamm adds a great deal of effortless glamour to the First Doctor edition of "Tomorrow's Times", which shows the the brief flirtation the British Press (notably the Daily Mail) had with Daleks and the earlier days of Doctor Who. Very reminiscent of an episode of Points of View in styling, this fun little extra begins the story - already continued on other DVDs for other eras of the show - of the love-hate relationship between journalists and The Doctor and his trusty TARDIS. Commentary - Toby Hadoke sits in the captain's chair once more; as Peter Purves, Shane Rimmer, David Graham, Richard Beale, and production assistant at the time Tristan de Vere Cole talk us through The Gunfighters. Always fascinating to listen to anecdotes and gems from a production made forty five years ago, this entertaining and useful extra on the DVD serves double duty; as switching on the commentary drowns out a great deal of the Ballad of the Last Chance Saloon. Photo Gallery - An amazing selection of vintage photographs of the set, cast, and production of The Gunfighters. The photo's have been cleaned up amazingly and there's some glorious views of the whole, from the TARDIS sans lamp to the camera tower erected in the middle of the studio to give some innovative camera angles to the production. Set to the full length version of The Ballad of the Last Chance Saloon. Brilliant if you know where the mute button is. Coming Soon Trailer - The death of Caretaker 345/12 Subsection B informs us that the TARDIS will soon be arriving at Paradise Towers, home of the Kangs, the Rezzies, and Pex (who puts the world of Paradise Towers to rights...). There's something nasty and very hungry in the basement... and on most other floors of the high rise building as well. Can The Doctor (Sylvester McCoy) and Mel (Bonnie Langford) find their way to the swimming pool without being put to a 327 appendix 3 subsection 9 death? 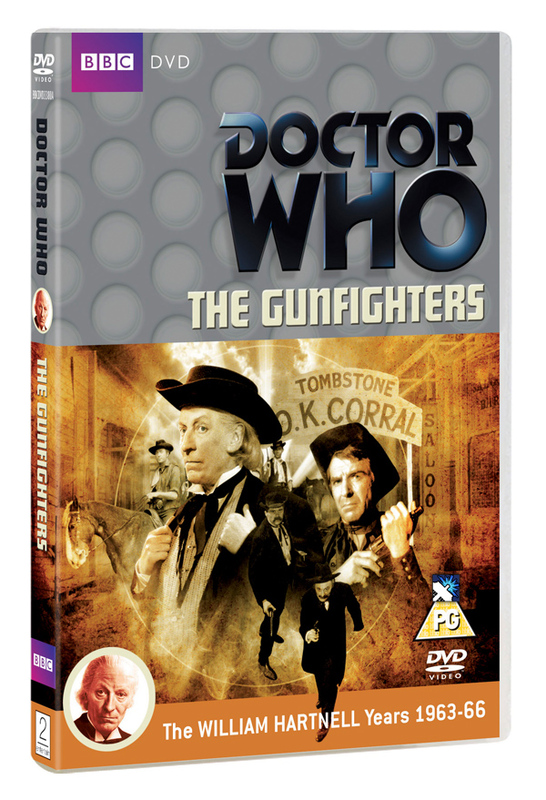 The Gunfighters DVD also has the listings from the Radio Times in PDF format, subtitles available, and the usual production notes are also included. A great package and well worth watching for some excellent performances and moments of genuinely funny comedy in a competent and well made Who story; if you can get past the singing. The Awakening is a short, punchy story that's a deserved fan favourite in the history of Classic Who. The cast are superb, the locations and sets stunning, and The Malus is one of the most memorable Doctor Who monsters for several reasons; notably because it works so well and it really does look creepy. Everything from the incidental music to the costumes seem to fit together seamlessly, and make a thoroughly enjoyable two part adventure. Stealing the show are Polly James as Jane, and Keith Jayne as Will Chandler, both of whom work so well in the story. Jane is the single voice of reason before The Doctor arrives, and Will is simply one of the most endearing and innocent supporting characters in Who's long history. And of course, The Awakening does have one of the most iconic monsters on hand in the shape of the Malus - even more remarkable when you consider it was only onscreen for a couple of minutes in total. The DVD release also has a number of very well thought out and produced extras that seem to exude a warm, happy glow about the story; and as always, sound and vision throughout the DVD are crisp and bright. Return to Little Hodcombe - A twenty minute look at the area, as Little Hodcombe was a gestalt of three villages, with the director Michael Owen Morris, script editor Eric Saward, and Janet Fielding (Tegan) and Keith Jayne (Will). From the outset of this piece, Morris brings senses of warmth and fondness to proceedings that are hard to ignore. He obviously enjoys his work - both on Doctor Who and his other projects - and it clearly shows. Making the Malus - A fun look at the giant face in the wall, with designer Tony Harding and model-maker Richard Gregory. A short piece on how the Malus was conceived and built, with a rare look behind the face to see how the different parts of the monster were controlled. To finish, there's a short interview with Paul Burrows who bought the Malus at auction and what happens when utilites workmen find giant stone monsters mounted on your living room wall... Another fun and entertaining short, and again, with some warmth and affection for the subject matter leaving you with a very positive feeling. Commentary - Toby Hadoke once again chairs the commentary team, this time with director Michael Owen Morris and Eric Saward as their share knowledge and opinions of the serial as an audio option on the DVD. Again, Morris' obvious fondness for his work shows through easily and keeps the mood light. Now & Then - The three villages used as locations in The Awakening are revisited to find that not a lot has changed. There's still thatched cottages and farm buildings, and there's still a ford across the road, even if it is now somewhat waterless... clips and photographs are used effectively, and the linking narration fills in any blanks nicely. From the Cutting Room Floor - Some extended and deleted scenes from the story, including an appearance by Kamelion. There's also some of the film rushes from the location shoots, and some timecoded VHS sequences that were trimmed. The Golden Egg Awards - Taken from another BBC1 staple of the time, this excerpt from The Late Late Breakfast Show hosted by Noel Edmonds shows the now infamous outtake featuring a horse, a cart, and a prop lychgate being unexpectedly demolished. Peter Davison is on hand to collect the trophy from Noel Edmonds. Isolated Music - The Awakening has some excellent incidental music, and this option of the DVD gives you a chance to view the story with the isolated music score. Well worth a listen if you're a fan of the somewhat under-appreciated composers on Classic Doctor Who. As usual, the DVD also features a photo gallery of production and publicity shots, the Radio Times listings from the story in PDF format, subtitles for those that may need them, and the Production Notes Info Text available to have onscreen as the story plays out. 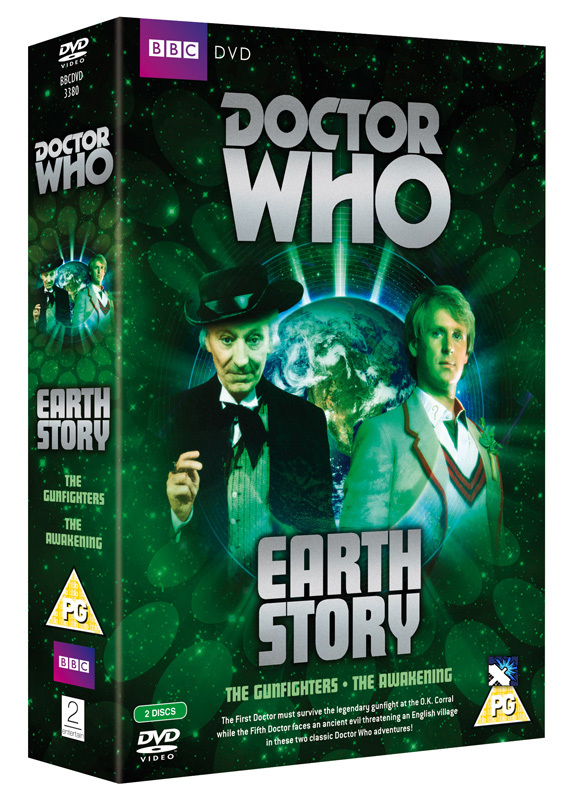 The Awakening is a great addition to Classic Doctor Who on DVD, and if you're a fan then the EarthStory DVD set is a must-have for your collection. + Watch Movies online and rent dvds straight to your door by signing up to LOVEFiLM today, rent a huge range of titles including all the classic Doctor Who titles. Review: The Revisitations Box 3 - DVDThe Revisitations Box 3, Doctor Who DVD Box-set Review by Dale Who for Doctor Who Online.Review: The War Games - DVDThe War Games, DVD Review by Doctor Who Online.Review: The Five Doctors 25th Anniversary Edition - DVDThe Five Doctors 25th Anniversary Edition, DVD Review by Doctor Who Online.